Thank you for visiting another one of Bayside Chrysler Jeep Dodge's exclusive listings! THIS 2012 Jeep Liberty HAS GONE THROUGH A 110 POINT SAFETY INSPECTION BY OUR A.S.E CERTIFIED MECHANIC! Bayside Chrysler Jeep Dodge Ram is Family owned and operated and has been selling cars nationwide for over 35 years! eBay is a great place to look at and buy a vehicles because of the safety and security it provides. We provide plenty of pictures and full descriptions of our vehicles so there should be no questions about the condition of the vehicle. Check out this gently-used 2015 Jeep Wrangler Unlimited we recently got in. This vehicle is loaded with great features, plus it comes with the CARFAX BuyBack Guarantee. This Jeep Wrangler Unlimited Rubicon defines excellence in an SUV. It has the convenience of limitless boundaries paired with city sophistication. No matter the terrain or weather, you'll drive at ease in this 4WD-equipped vehicle. With exceptional safety features and superb handling, this 4WD was engineered with excellence in mind. It's not a misprint. And the odometer isn't broken. This is a very low mileage Jeep Wrangler Unlimited. A rare find these days. Buy or Lease your next New or Pre Owned Vehicle from Bayside Chrysler Jeep Dodge Ram! with thousands of reviews from Satisfied Customers! 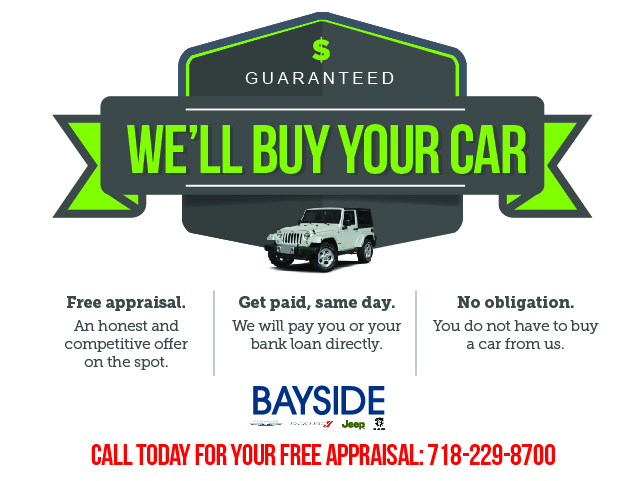 Buy with Confidence from Bayside! Don't hesitate to contact Bayside Chrysler Jeep Dodge. This Jeep Liberty won't last long. At Bayside Chrysler Jeep Dodge, we strive to provide you with the best quality vehicles for the lowest possible price, and this Liberty is no exception. We love to say yes you are approved! Same day delivery available! Buy with Confidence from Bayside Chrysler Jeep Dodge Ram! *For Leases: Lessee responsible for maintenance and all excess wear/tear. Leasing &/or Financing: All offers subject to approval by primary lender. *Not responsible for typographical errors or program allowance changes prior to publication. *In stock vehicle only for applicable promotion. Chrysler, Jeep Dodge & Ram are registered trademarks of FCA US LLC.